Cats are by nature fussy and clean animals. You can see them always licking their fur to make it clean and always in proper place. However, even the fussiest cat needs little grooming most especially those having long hair. Grooming your pet cat is also a great way to create the bond between the pet and the owner. It is also a good time to check your cat's body for any possibility of skin and coat problem such as cat shedding. 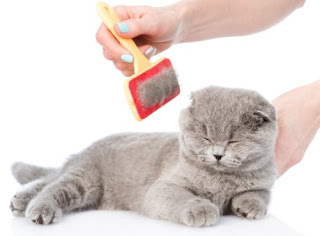 Make your cats get used to regular hair brushing and combing while they are still young. Constant combing will remove dead hair and irritating knots as well as lessen the hair swallowed and the smaller amount of hairballs. When the fur of your cat is not tangled, just brush her hair for at least five minutes. Most cats like having their hair brushed. If your pet is not comfortable with it, just let her go but you need to try again until she'll get used to it. There is more time required for brushing longer haired cats. If there are tangled masses of fur, careful and patient brushing should be employed. To prevent pulling the hair and hurting the cat, hold the fur below the tangles while brushing. When your cat's hair is really stubborn, it will be wise to take her to the professional grooming shop. Cat shedding can also be prevented when the pet is given the proper nutrition. Unless the cat is really dirty or has skin allergies, shorthaired felines do not require bathing. For cats with long hair, regular bathing is important to maintain the good condition of her coat as well as prevent grease build-ups. Most cats are not keen on bathing because they don't usually like getting wet. However, you can make the task easier by having a shampoo and towel nearby for quicker bath time. If you cannot manage the cat alone, ask someone to lend you a hand during the cat's bath time. Before you give your cat a bath, make sure that tangles in her hair are removed by combing them first. Tangled hair can shrink and tighten when they get wet. If you will bathe your cat in the tub, make sure to fill the bath first with water prior to bringing her in. Noise and water motion can cause agitation in cats that can also make bath time a hard task. Make sure that the water in the bath is only filled up to the cat's belly. Test the temperature of water to ensure that it's not too hot. Instead of the bathtub, you can prepare soapy warm water in one pan and another one for rinsing. The amount of water should be just enough for a brisk bath. Don't pour the water directly to the cat's head or submerge her in the water. During the bath, your cat will sometimes howl, but she's perfectly fine. It's just a sign of surprise and perhaps she's a little frightened. Once you're done with the bath, wrap her gently in a towel and hug her for a moment. This will give her feeling of assurance. It is also a form of bonding between you and your pet.